The BBC hit Pie In The Sky aired from 1994 to 1997. Unlike most US shows, a many English programs are produced as separate, multi-part series. The original Prime Suspect with Dame Helen Mirren is one example of this approach, as was Upstairs Downstairs. The The Complete Pie In The Sky, a 13-DVD box set, contains all five series of the acclaimed show. 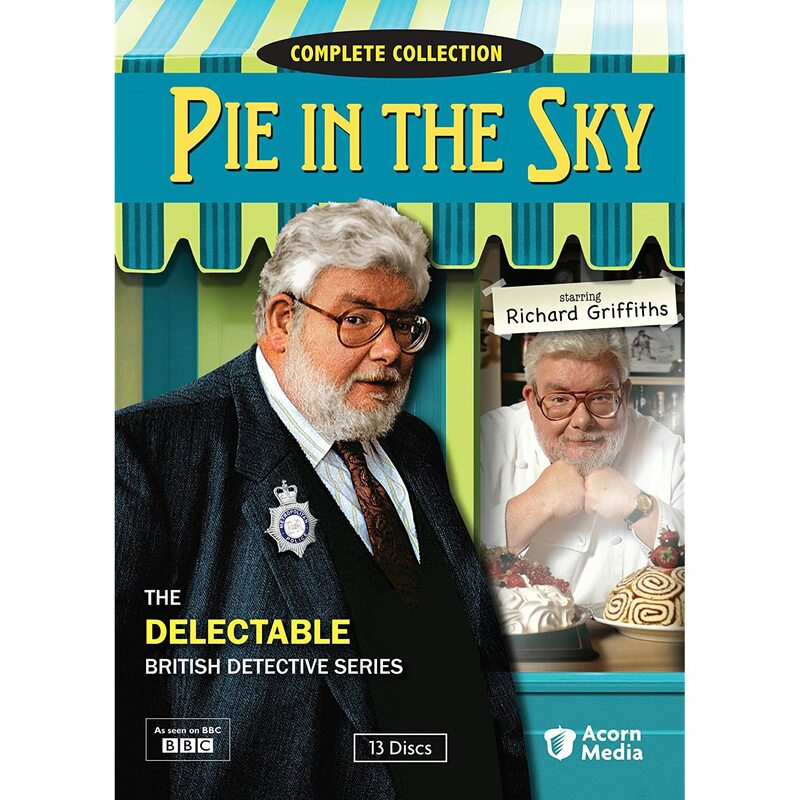 The premise is that Detective Inspector Henry Crabbe (Richard Griffiths) has spent 25 years on the police force, and leaves to pursue his dream of opening a restaurant, the titular Pie In The Sky. While the operation of the eatery with his somewhat dour wife Margaret (Maggie Steed) offers much comic relief, the old cop keeps getting pulled back into solving cases at seemingly every turn. The problem for Crabbe is that he is just too good at his job, and his superiors do not wish to let him completely leave the force. A compromise is reached, but he finds himself doing far more detective work than what he thought he had bargained for. The first episode, “The Best Of Both Worlds,” lays out the situation pretty clearly. In it, we find Detective Inspector Crabbe just seven weeks shy of retirement. During what was to be his last case, which focused on police corruption, Crabbe finds himself in the unintended position of appearing to take a bribe. His superiors use this situation to “blackmail” Crabbe to stay on as a DI in a “reduced” role. From here on out he is both a restauranteur and a Detective Inspector. Sometimes being the best at your job is tough, and our hero must straddle both roles throughout the five series. There is a very quirky and very British sense of humor at play throughout each of the 40 Pie In The Sky episodes. The stories are interesting detective mysteries which never pander to the audience, and the acting is superb across the board. Although Pie In The Sky was popular throughout its run in the UK, it never really caught on in other markets. A shame really, for this was an extremely enjoyable program, and one which should have found favor outside of its native country. Acorn Media has previously released each of the five series as separate DVD sets. They have now consolidated all 40 episodes into the very rewarding complete collection, for those of us who are curious about one of the '90s finest British detective shows. Extras are minimal, the most notable being an 18-minute interview with Maggie Steed. As is often the case with Acorn however, this is a reasonably priced, all-encompassing set of an excellent British program. The Anglophile in me jumped at the opportunity to check it out, and Pie In The Sky is highly recommended. Like all of most of your reviews this one sounds great greg!